Finally Lilian's application was approved, and she booked passage on the Queen Elizabeth. I traveled to New York by train to meet her. 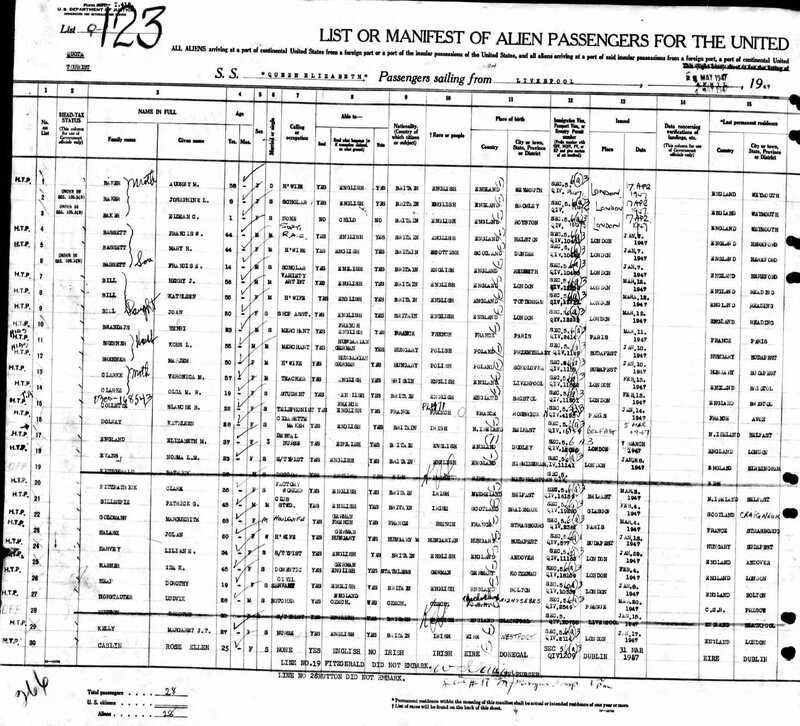 It was possible to obtain a boarding pass, but it meant a long ride down to lower Manhattan, with the possibility of delay and of missing her as a result. Instead I stood pressed against a picket fence which separated the people waiting from the people disembarking. When I saw her coming through the shed, it seemed obvious she wouldn't see me. "Give me a boost", I said to the fellow next to me. With his help I hurdled the fence and dashed to her side. A British attendant yelped "Here, you can't do that! ", but I quickly hugged her and arranged to meet her outside. I had ruined a good pair of shoes on the fence, but it was worth it. The Queen Elizabeth sailed from Liverpool on Sunday, May 4, and arrived in New York on Friday, May 9. 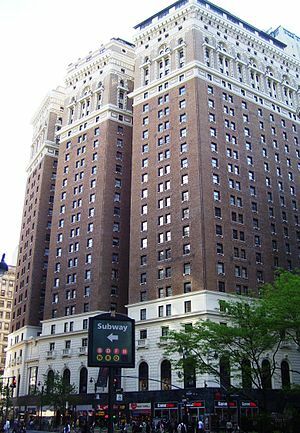 We had reservations at the Hotel McAlpin, a large place on Herald Square, 34th and Broadway. The next day we had to go to get our license at City Hall. It was Saturday and the license bureau was to close at noon. We hadn't allowed enough time, and it was five minutes to twelve when we scampered breathlessly into the office. When the clerk asked if I had brought a copy of my divorce, I thought it was all up, as I hadn't thought of it. Fortunately, she didn't insist, and we received the license. The former Hotel McAlpin is now an apartment buiding named Herald Towers. There would be a mandatory 72-hour waiting period before we could be married, which would make it Tuesday at the earliest. We started looking around for a place in which the nuptials could be performed. First we went to an Episcopal church usually referred to as The Little Church Around The Corner. It had ties to the world of the theater; many well-known actors and actresses had been married there. Rev. Randolph Ray let us down gently, explaining that my divorce prevented our marriage there. He had been forced to refuse to marry his own daughter for the same reason. We then went to the Marble Collegiate Church only about a block away, and made arrangements for a Tuesday wedding. We could then say that we were married at the church around the corner from the Church Around The Corner. 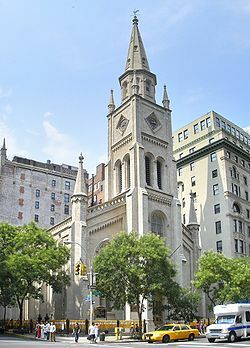 View the history of Marble Collegiate Church. The current building was constructed in 1854, but the congregation can trace its roots to 1628. On Tuesday we walked over to the church some five or six blocks from our hotel, arriving a few minutes late. Although as previously mentioned, this is the home church for the Rev. 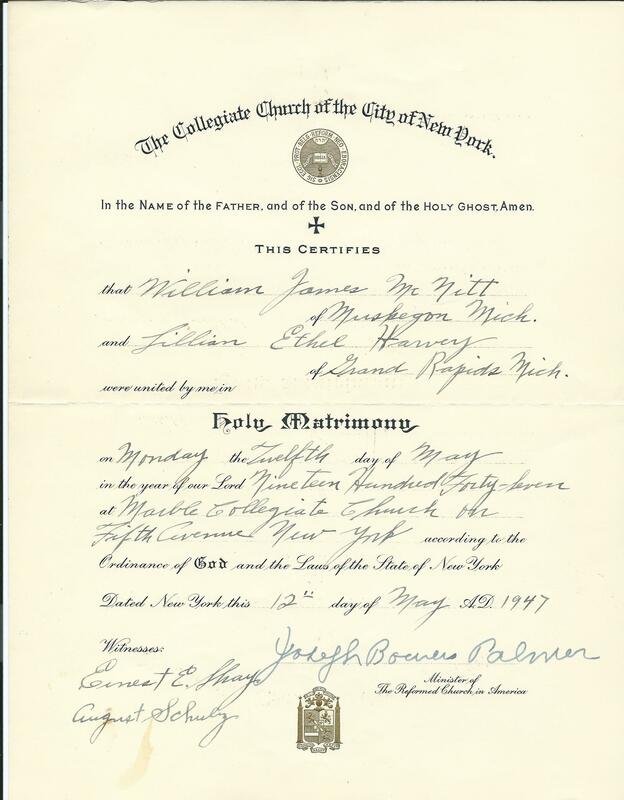 Norman Vincent Peale, we were married in a simple ceremony by one of his assistants, Rev. Joseph Bowers Palmer. Two custodians signed as witnesses. They did not marry on a Tuesday. May 12, 1947 fell on a Monday. 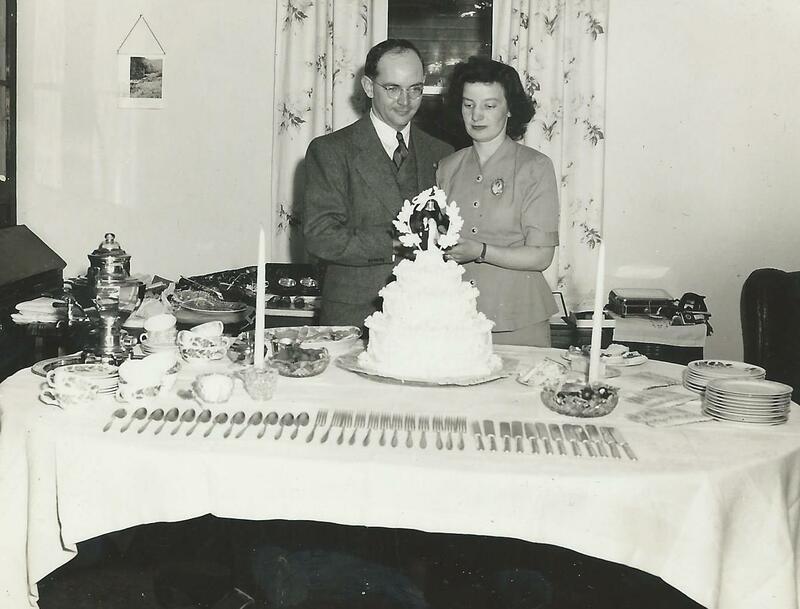 We went to Gimbel's Department Store, across from the hotel, for our wedding pictures. Lilian was still wearing the camellia which we had picked up earlier. I noted that the photographer was using a Texaco pencil in writing down the order. It turned out her husband worked for Texaco on Long Island. Our wedding dinner was at Schrafft's, one of a well-known chain. 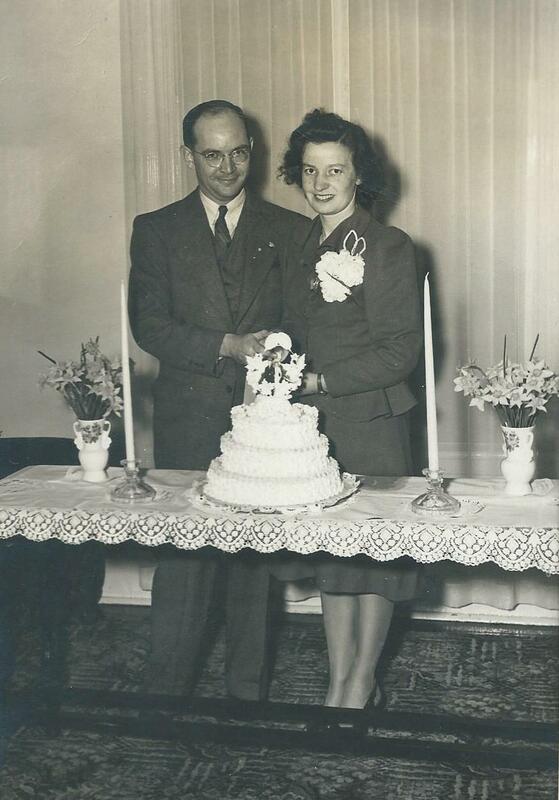 This is the only one of the wedding photographs that I have found so far. The next day we boarded the train for Michigan. Here, as we started our life together, I draw my story to a close, with the possibility of adding a few footnotes later. Wedding reception for the newlyweds at the Aunts' house (107 Logan SE, Grand Rapids) soon after their arrival in Michigan. 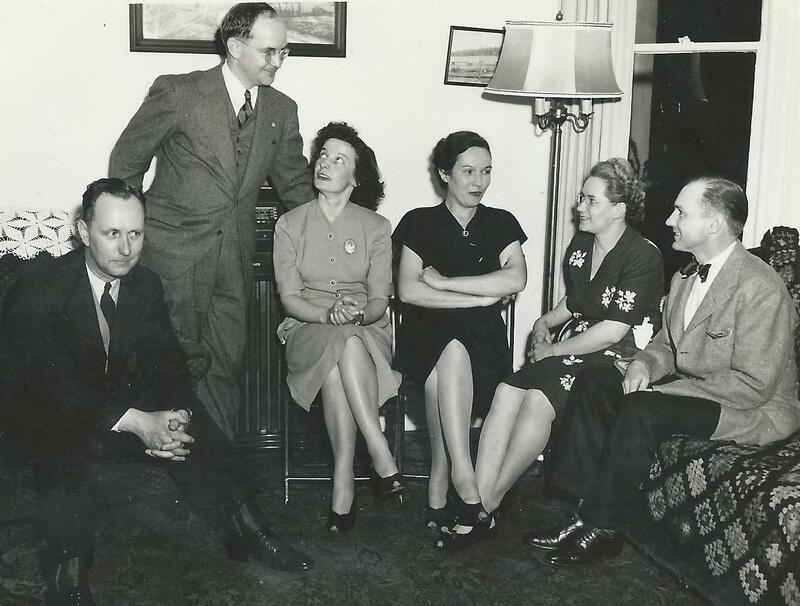 The third photograph shows Dad's brother Walter, Dad, Mom, Catherine (Walter's wife), Cecile (Glenn's wife), and Dad's brother Glenn. 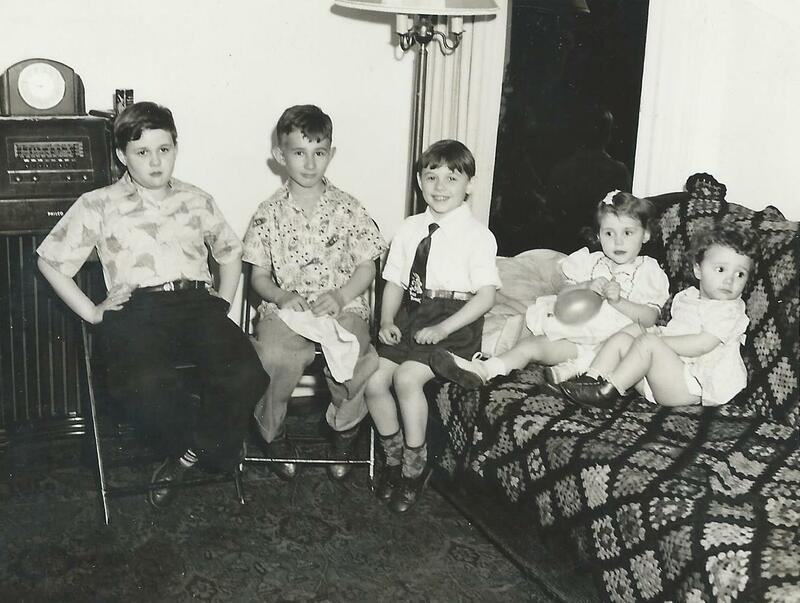 The fourth shows the McNitt nephews and nieces at the reception - Glenn, Walt, Ted, Kay,and Charlene. 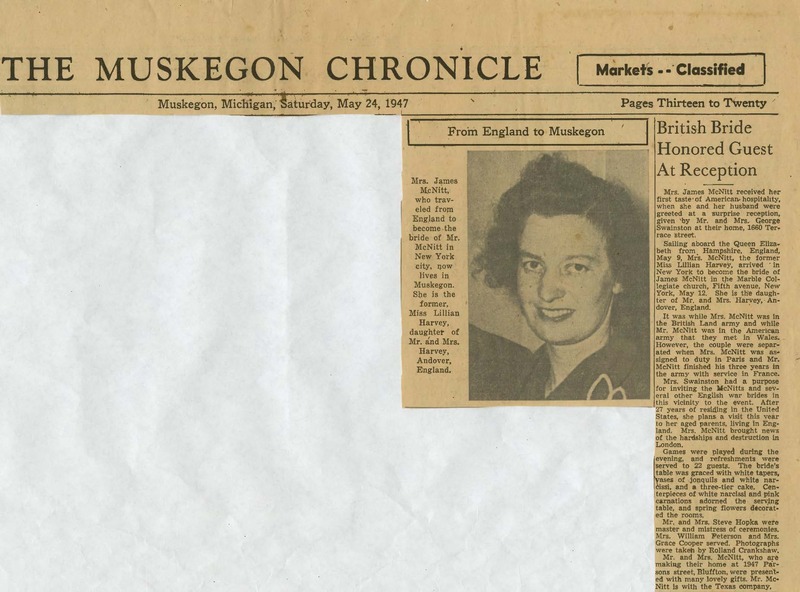 Newspaper story about a reception hnoring Mom held in Muskegon attended by several other British war brides. In reading the article, please note that Mrs. Swainston has the story of how Dad and Mom met incorrect - they met in France, not in Wales. 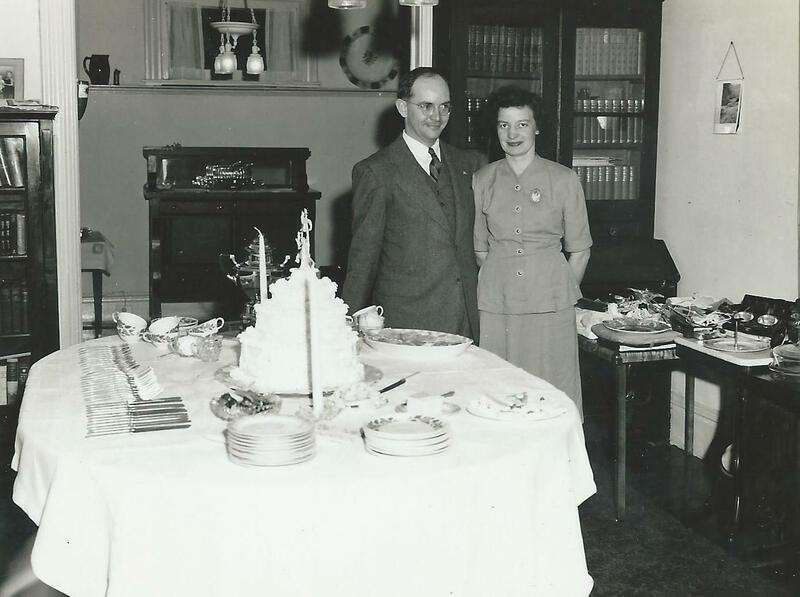 When they arrived in Grand Rapids, Dad's aunts - Myrnie and Leena Merrill - hosted a wedding reception to allow his family and friends to meet Mom. Dad and Mom then went on to Muskegon. Soon after arriving there, Mrs. Beatrice Swainston, who had been born in England, organized a reception for Mom to wlecome her to America.